One of the most important concepts of that one learns in the Chinese movement arts is a central area called the Gate of Life or Door of Life. Learning how to work with the Gate of Life can bring more energy to your Kidneys, meridians and brain. It can help you have more oomph for expressing yourself in the world and often will even eliminate lower back stiffness or pain. The Gate of Life is a small circular area found in the center of your lower back, just behind and at the height of the belly. The Gate of Life is exactly opposite where your belly button is. To me, the active area of the Gate of Life seems to be about the size of an American dime. 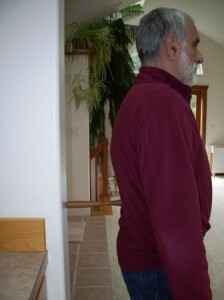 In Qigong practice you learn how to use the dime-sized area as a pivot point for moving your torso. Learning this skill is a great aid in building usable energy, kinetic power, and saving yourself from many pains. In teaching this movement principle over the years I have found many students and clients have a rough time figuring out how to turn their waist from that place. They’ve never thought of it before nor tried it. People will usually try to move their torso (and arms) from anywhere but the Gate of Life: By turning the pelvis, twisting the hips and knees, turning the upper back, moving the shoulders or arms, etc. The whole area was locked. 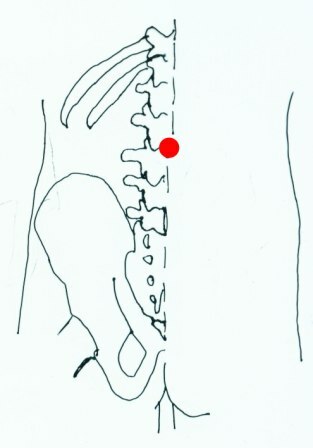 All of her torso movement came from above or below the lumbar spine. She had forgotten how to use the muscles, vertebrae and fascia rotationally in that area. For most people, this is a habit they have picked up. I think it is probably common in a chair-centric culture like ours. I tried to get her to move from this area (the Chinese “waist”) by having her turn in a very small motion on the horizontal plane. She wasn’t able to access the body knowledge to do it. As I’ve seen a number of students do, she tried to carry the movement of the Gate of Life area by twisting her upper back, throwing her arms and shoulders to one side or the other or pushing wholly with the pelvis. In other words, she was doing exactly opposite of the idea. Instead of controlling torso movement from the Gate of Life, she was moving from everywhere else. A much less effective method of movement. Then I had an idea. I wondered if some direct pressure to the Gate of Life area would give her body the feedback she needed to learn the technique. Pressure on the lower abdomen works for learning belly breathing, why not for this? 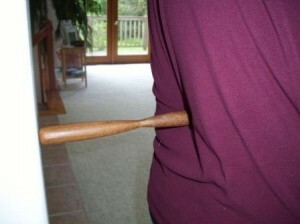 I happened to have had a short, finished rounded stick used for ringing a small bell. The surface area of the end is small, about the size of that dime. Perfect. The end is also fairly flat. I put the end of the stick on the wall and the other end on her Gate of Life. She shuffled backwards just a little in order to keep the stick in place. The stick was horizontal to the ground and perpendicular to her back. Her body was vertical. Then I told her to gentle push just her lower back backward a little—not the whole body. In other words, to slightly round her lower back toward the wall. This is the first step in opening the Gate of Life. 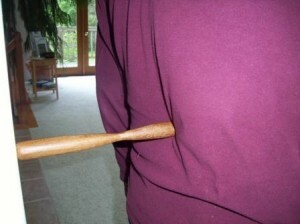 Below is a photo of my Qigong and Tai Chi training partner Bob Shapiro activating his Gate of Life with the bell-stick. The main practice then is to use the light force of the stick in the back (it is gently held in place, not jammed in) as a prod and prompt to turn left and right. These turnings are minute, and should originate from the stick end touching the Gate of Life. It is important to keep the bubble of the area pressed back and not just lean into it bodily. Push the stick into the wall—a little—with just the pinpoint end. My client was able to get a definite sense of moving from the Gate of life with this method. The horizontal movements were small, but definitely coming from that central pivot area in the lumber spine. This was a new way for her to move and one that will need more practice. She could feel an awakening of awareness, musculo-skeletal movement, warmth, and energy flow. In Acupuncture terms, the Gate of Life is a point on the Governor Vessel (Du Vessel) called GV-4. 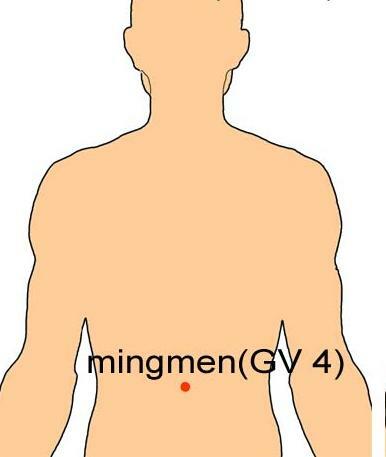 It is also called the Ming Men. Anatomically the Gate of Life is generally on or just below the tip of the spinous process of the L2 vertebrae. 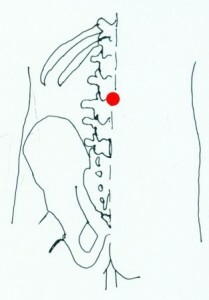 It tends to be at the deepest portion of the lumbar curve, the part closest toward the belly on the front. Many people overarch their lower backs forward, which closes the Gate of Life to full energy flow. The Peak of this arch is the closed gate.